A new simple empirical function has been developed that estimates the free energy of binding for a given protein-ligand complex of known 3D structure. The function takes into account hydrogen bonds, ionic interactions, the lipophilic protein-ligand contact surface and the number of rotatable bonds in the ligand. The dataset for the calibration of the function consists of 45 protein-ligand complexes. The new energy function reproduces the binding constants (ranging from 2.5·10-2 to 4·10-14 M, corresponding to binding energies between -9 and -76 kJ/mol) of the dataset with a standard deviation of 7.9 kJ/mol, corresponding to 1.4 orders of magnitude in binding affinity. The individual contributions to protein-ligand binding obtained from the scoring function are: ideal neutral hydrogen bond: -4.7 kJ/mol; ideal ionic interaction: -8.3 kJ/mol; lipophilic contact: -0.17 kJ/mol Å2; one rotatable bond in the ligand: +1.4 kJ/mol. The function also contains a constant contribution (+5.4 kJ/mol) which may be rationalized as loss of translational and rotational entropy. 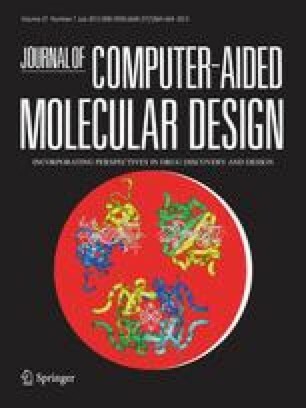 The function can be evaluated very fast and is therefore also suitable for application in a 3D database search or de novo ligand design program such as LUDI.